Chelsea Defender under the spotlight after new arrivals. Could this be the beginning of the end? With 12-months remaining on his contract at Chelsea, Branislav Ivanovic faces an uncertain future after Antonio Conte dramatically changed his transfer focus on deadline day. Now those deals are complete, the Serbian could find himself relegated to the bench. Having initially told Chelsea he just needed a new centre-back in the summer, Antonio Conte changed his mind and urged the club to also sign a new left back which led to frantic negotiations taking place. Chelsea delivered what Conte wanted and Marcus Alonso joined David Luiz in signing for Chelsea. Make no mistake here, the two signings are key and both offer flexibility for the Conte with his options at the back. As we have seen previously David Luiz can play anywhere across the back four but it's the adaptability of Alonso that is a surprise bearing in mind that he can play either as a natural left back or as a centre-back which opens the door to a complete change in formation to three at the back for the Italian who is known to favour this tactical approach. 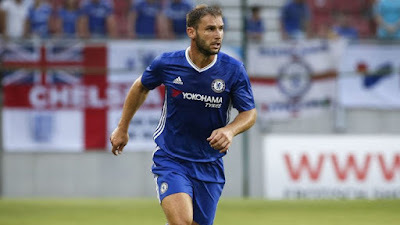 As I have stated many times previously, Branislav Ivanovic has been a fine servant for Chelsea since joining in 2008 and has helped us achieve amazing success. However, Football moves on and doesn't wait for anyone and we all are aware at his staggering dip in form along with his team mates last term. He was roasted in the first game of last season against Jefferson Montero and Swansea and never seemed to get over it. The pace of our game has changed and has become quicker. Players have become fitter and faster and Ivanovic has almost been left behind as he does his best to keep tabs on his marker. Of course it all depends on what Conte wants to do. With David Luiz coming in, I would suggest that John Terry is under pressure to keep his place in addition to Ivanovic. But, as we have suggested, Conte could make the switch to three at the back and there still could be use of JT and Ivanovic within that framework. I think it's clear that if we continue with the formation we have adopted at the start of the season, Ivanovic and JT could be replaced straight away by Alonso and Luiz with Cesar Azpilicueta reverting back to the right hand side. Do not disregard what I am saying here outright because we have seen with Cesc Fabregas that Antonio Conte is not afraid of leaving the big players out if they do not fit into the team he wants for that particular game. Ivanovic has more to worry about than JT at this stage in my view. What do you think?